I coppice an ancient oak woodland in South Cumbria to make traditional Cumbrian oak swill baskets. Using the same material, skills and techniques I make other styles of basket, backpacks, shoulder bags, lighting and other woven wooden products in oak. 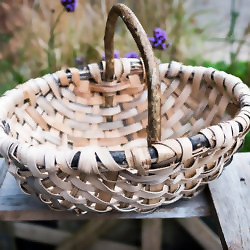 I also make and teach splint wood baskets in hazel, in groups or 1-2-1. Basketry details in oak bark tanned leather. Occasionally make other coppice products such as fencing, gates, besoms & treen. Graduate of the Bill Hogarth Memorial Apprenticeship Trust.